Did you ever want to study what the Law of Moses says on a topic, but you weren't sure where to find it? Now you can with this multi-index of the Torah. Index 1 features major topics including Preamble, Worship, Physical Purity, Business Dealings & Politics, and Morality, with numerous sub-topics. Index 2 is an alphabetical listing of each command, according to keywords. Index 3 lists all of the commands in the order they occur in Exodus, Leviticus, Numbers, and Deuteronomy. Index 4 lists the 613 commandments, first compiled by Rambam (Maimonides): 248 positive commands and 365 negative commands. This final list ends with a glossary of technical terms. 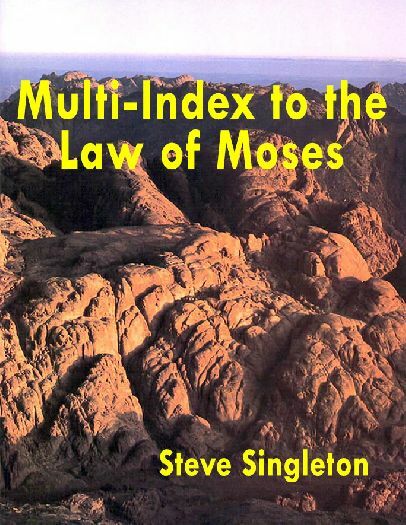 This multi-index provides the resources for a thorough study of the Law of Moses, or the basis for a quick check on any topic. 39 pages. 565kb.